Artist's impression of Polaris and the constellations of the Big and Small Dippers. (PhysOrg.com) -- The Northern Star, whose vibrations were thought to be dying away, appears to have come to life again. An international team of astronomers has observed that vibrations in the Pole star, which had been fading away to almost nothing over the last hundred years, have recovered and are now increasing. And the astronomers don't know why. Plot of decrease over 100 years of amplitude of 4-day light variation of Polaris and of the increase since 2000. Observations before 2000 from other work, observations after 2000 from this work. The discovery will be announced during the "Cool Stars 15" conference at the University of St Andrews. Dr Alan Penny from the School of Physics and Astronomy will present results of the recovery to around 350 international delegates at the meeting that runs from July 21-25. The astronomers were watching Polaris in the expectation that they would catch the star switching off its vibrations completely when they made the surprising observation of its revival. Dr Penny explained, "It was only through an innovative use of two small relatively unknown telescopes in space and a telescope in Arizona that we were able to discover and follow this star's recovery so accurately." Team leader, Dr Hans Bruntt of the University of Sydney, had been using a small telescope attached to NASA's now defunct infrared space telescope (WIRE) to study the star for a short period of time. He knew Dr Penny was using a device known as the SMEI space camera - predominately employed to watch matter being ejected from the Sun - to do long-term monitoring of stars. When the SMEI data were analysed this recovery of Polaris was seen, and could also be traced in the WIRE data. Professor Joel Eaton of Tennessee State University was also doing long-term monitoring, and, using the AST automated spectroscopic telescope located in Arizona, was able to confirm the observations of Polaris by watching the change in velocity of the surface of the star as the variation caused it to expand and contract. Although Shakespeare's Julius Caesar declared, "I am as constant as the Northern star, Of whose true-fix'd and resting quality There is no fellow in the firmament", Polaris is a 'Cepheid' variable star, getting brighter and fainter every four days. Cepheids do play a vital part as 'standard candles' in determining the size of the Universe, but the details of their variations are not well understood. Dr Penny said, "One hundred years ago Polaris varied by 10%, but over the last century the variations became smaller and smaller until ten years ago it only varied by 2%. "It was thought the structure of the star was changing to switch off the vibration. Yet the team has found that about ten years ago the vibrations started picking up and are now back up at the 4% level." 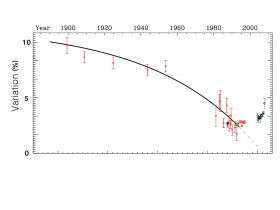 The slow decline in variability was in itself unusual, as no other Cepheid is known to do this. 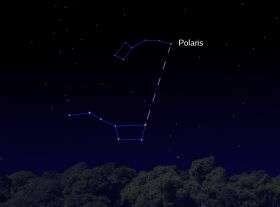 Astronomers thought that Polaris was ageing and its structure was changing so that it was no longer unstable. This was being followed to learn about how stars age. Now Polaris has 'turned on' again this explanation seems unlikely and there may be a complex process in the outer layers of the star, with more than one mode of variability. how about planets, passing in front of that star? It is a Physorg article. Their reporting is now as much garbage as their forum. It figures that the facts are WEAK. long live the mighty polaris! Variations in Earth's climate and in luminosity of the Sun and other stars has been a mystery because astrophysicists have blindly insisted that Hydrogen-fusion is the energy source. However, recent research findings in nuclear physics are about to destroy the illusion that stars are balls of Hydrogen. About sixty-five (65) nuclear physicists at Brookhaven National Laboratory, the Thomas Jefferson National Accelerator Facility and several other leading research facilities and universities around the world, including MIT, have cautiously confirmed strongly repulsive forces between neutrons. This signals the certain demise of the standard model of Hydrogen-filled stars. This "Cradle of the Nuclides" showed that neutron-proton interactions are attractive, unlike proton-proton and neutron-neutron interactions , and exposed repulsive forces between neutrons as the energy source that powers the Sun, ordinary stars, neutron stars, and the cosmos [2-10]. A. Nucleons "repel each other strongly" at close distances. B. "In nature there exists another way to create dense nuclear matter by using another force to overcome the strong inter-nucleon repulsion at short distances. Neutron stars . . . . . This dense nuclear matter is created by the large gravitational force, which adds the necessary compression." C. "The difference between neutron-proton and neutron-neutron or proton-proton pairs is due to the nature of the nucleon-nucleon interaction. The tensor force in the neutron-proton interaction, which is missing in the neutron-neutron or proton-proton interaction, is probably what creates the difference between cold dense matter of nucleons of the same kind, and cold dense matter of mixed nucleons." D. "These surprising new results were confirmed in a higher-precision experiment completed recently at Jefferson Laboratory in Virginia." The results of measurements at Jefferson Laboratory were recently published in the 13 June 2008 issue of Science magazine . This paper stresses the high number of neutron-proton pairs in Carbon-12 from attractive neutron-proton interactions. Apparently unaware of the Sun's neutron-rich core, the last sentence of the abstract notes that their findings may be of general interest to astrophysics: "This difference between the types of pairs is due to the nature of the strong force and has implications for understanding cold dense nuclear systems such as neutron stars." 01. O. Manuel, C. Bolon, A. Katragada, and M. Insall, "Attraction and repulsion of nucleons: Sources of stellar energy", Journal of Fusion Energy 19 (2001) pp. 93-98. 02. O. Manuel, C. Bolon, M. Zhong, and P. Jangam, "The Sun's origin, composition and source of energy", Abstract 1041 , 32nd Lunar and Planetary Science Conf., Houston, TX, March 12-16, 2001, LPI Contribution 1080 (2001) ISSN No. 0161-5297. 03. O. Manuel, E. Miller, and A. Katragada, "Neutron repulsion confirmed as energy source",Journal of Fusion Energy 20 (2002) 197-201. 04. O. Manuel, C. Bolon, and M. Zhong, "Nuclear systematics: III. The source of solar luminosity", Journal of Radioanalytical & Nuclear Chemistry 252 (2002) 3-7. 05. O. Manuel, "The standard solar model versus experimental observations", Proceedings of the 3rd International Conference on Beyond Standard Model Physics - BEYOND 2002 (IOP, Bristol, editor: H. V. Klapdor-Kleingrothaus, 2003) pp. 307-316. 07. O. Manuel, Barry Ninham, and Stig Friberg, "Super-fluidity in the solar interior: Implications for solar eruptions and climate", Journal of Fusion Energy 21 (2002) 193-198. 09. O. Manuel, S. A. Kamat, and M. Mozina, "The Sun is a plasma diffuser that sorts atoms by mass", Physics of Atomic Nuclei 69 (2006) pp. 1847-1856; ISSN 1063-7788.